What is your title/the title of the internship and what do you do? I am an intern for the Natural Resource Management Department. My supervisor and I have been completing a project regarding Monarch butterflies and the milkweed that is a required food source for their larval stage (caterpillars). We are looking over the number of milkweed patches that are in the park and making a plan on ways to expand those numbers so that there is more habitat provided for them. How did you find out about this internship and why did you want to do it? 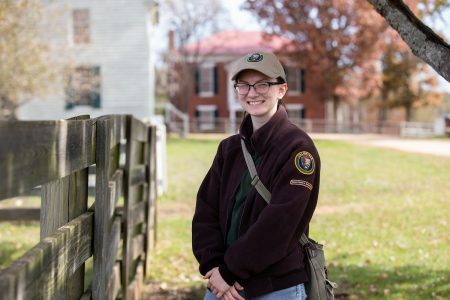 I found out about the internship through internship coordinator Maegan Crews and Alyssa Holland, the volunteer coordinator at the Appomattox Courthouse National Historical Park. She notified me, and I applied by writing a cover letter and providing my resumé. 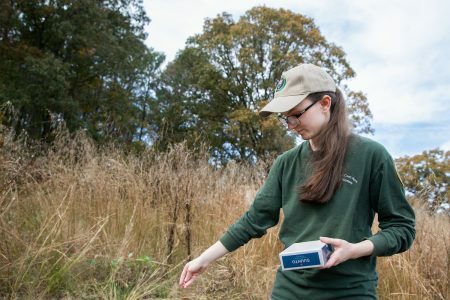 Andrea Wilson ’20 plants seeds for milkweed—a required food source for Monarch butterflies in their larval stage. What are you getting out of this experience and how does it correlate with your biology major? What I am getting out of this experience is the opportunity to look into what a job in the field of conservation is really like. This does correspond nicely with my major. The only thing that would really help me is taking Botany, which I haven’t yet. I use a little of the information I learned in Zoology to help me understand the butterflies’ lifecycles and the other animals that interact with those butterflies. What are your future career plans and how will this help prepare you? I am still not completely sure what I would like to do with my life, and to help me figure that out, I plan on doing other internships that are in different fields of biology. This internship has provided me a great understanding of the field of conservation, which I am very pleased with.